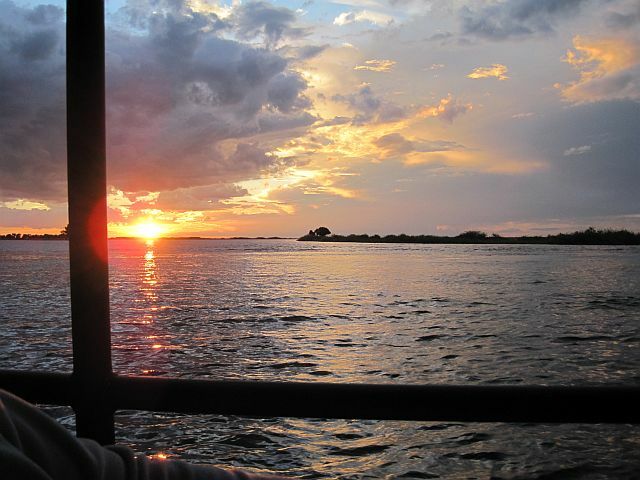 Once we finally managed to get onto our campsite in Chobe, we had a mad rush to pitch our tents so we could make the Chobe River game cruise. I was in a foul mood and we were all trying to ascertain what the hell went wrong and why each party seemed to think the campsite belonged to them. Had we had time to think before we dashed to join the boat, we might have grabbed something warm. Alas, some of us did not. As the sun dipped, so did the temperatures. Lucky for me, one of the German guys kindly let me wear his warm top. I felt so sorry for two young girls in skinny strap tops who sat shivering. The boat had drinks on sale for those who wanted them and as we headed along the river our collective mood lifted. The boat guide pointed out creatures that we would never have spotted. We saw lots of birds, buck and deer, crocodiles, monitors, hippopotamus and a herd of elephants. 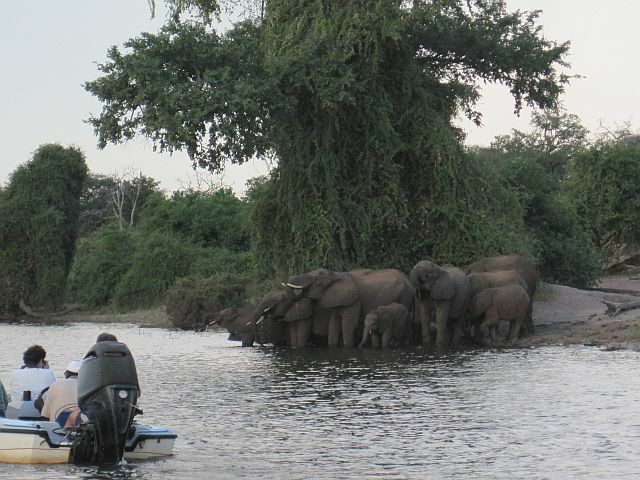 The elephant herd came right up to the waters edge and they drank their fill under our noses. There were the cutest little elephants. If only we could have them as pets. They are adorable. The guide gave us lots of information about the animals and their behaviour which I found most interesting. He pointed out that the river runs between Angola, Zambia, Namibia and Botswana. There have been disputes over which land and which islands belong to which country. Seeing the wildlife from the water is so completely different to viewing it from the truck on land and I am so glad I had the chance to experience a water based game drive. We enjoyed a spectacular sunset and arrived back at the jetty next to the main hotel. The usual rush to get showered before we took a drive to one of the other Lodges to try out the food at their restaurant. There were equally as many people staying there. Wiki says that Botswana had 843 314 000 visitors in 1999. Income from tourism was $313 million in 2000. That’s a LOT of people and I can well believe it. Botswana, like Namibia and most of the countries nearby have had a lot of rain. 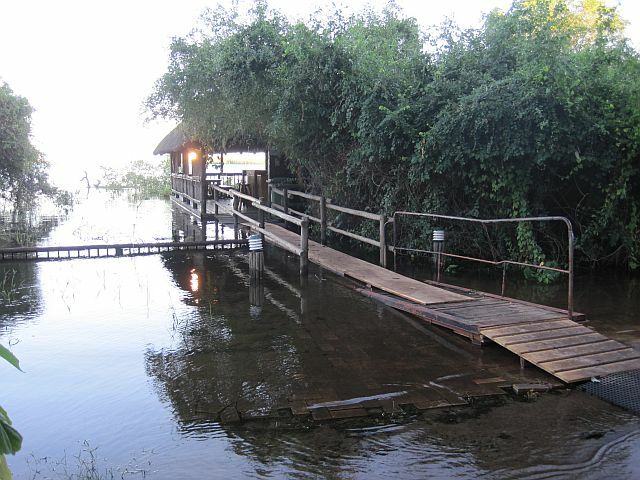 There were walkways created so people could walk about the campsite and grounds at the Chobe Safari Lodge. And our venue for supper, Thebe Safari Lodge, was no different. While Namibians happily accepted ZAR, in Botswana, they charged you more if you paid in ZAR. So we used our credit cards. Things are more expensive in Botswana and we might have had better food if we had tried one of the expensive places. Since we were camping and on a budget most of us tended toward more affordable options. Our meal wasn’t all that and our waitress was awful. She couldn’t manage to bring me a glass of water because she only took food orders. Not that there was a separate person who took drinks orders. That person was her, but she couldn’t write that down for some reason. I went and took a glass from the pub and got my own water. All I am saying, is don’t expect service, and you will be fine. My meal was a toasted cheese sandwich with a salad and a glass of wine which was ZAR104.00 or $15. The next morning we packed up and made our way to Zimbabwe. That was the last night we spent camping. I think the duration of the tour was about right. I can imagine that camping for weeks on end with a large party could get tiring. I also think that if people live and exists so close together 24 hours a day, every day, tension can mount. What seemed a charming quirk can become downright irritating. I was also looking forward to a long hot bath. Namibian border control is so easy and the Namibians are such warm friendly people. 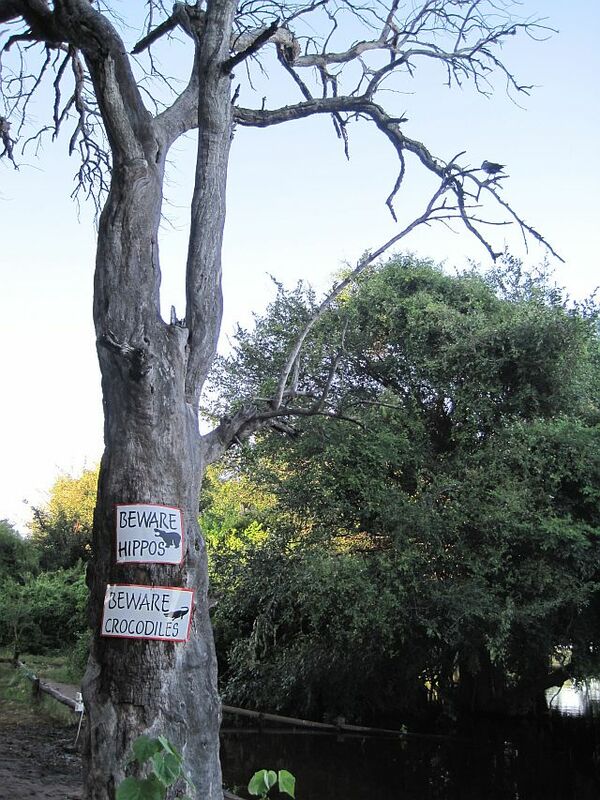 Botswana was a lot more regulated and they aren’t the most friendly people I have met. 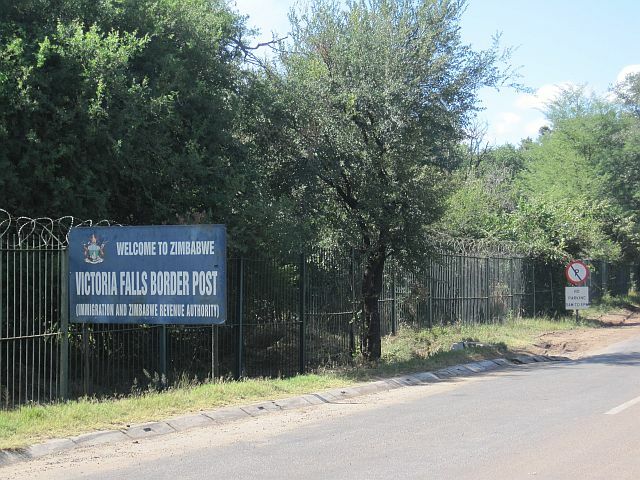 Zimbabwe is a great place for Saffas to visit but not as easy for Europeans. I spoke a few words in Zulu to the guy behind bars and I was in and out with a smile and a stamp. The Germans had to pay for a sticky visa to go in their passports and it took a while. Click here to go to last piece – Part 10.